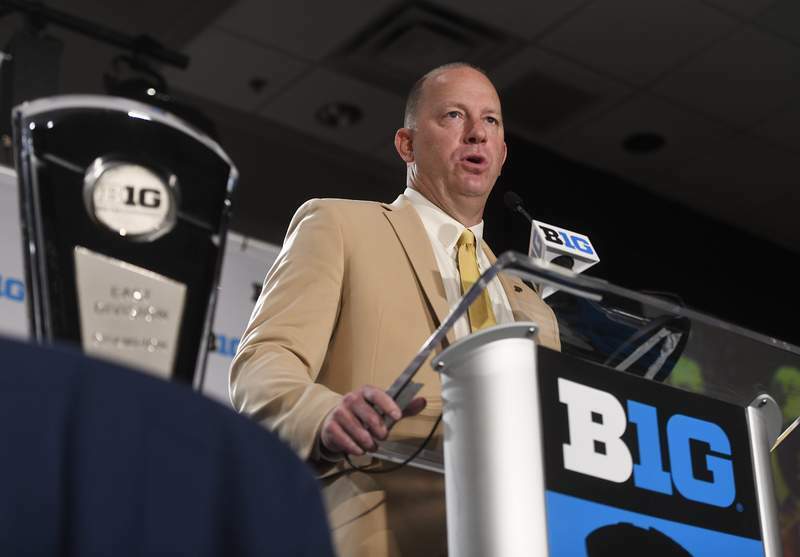 CHICAGO – Purdue coach Jeff Brohm, entering his second season at the helm, spoke at length with the media Monday, giving his thoughts on a wide range of topics during the half-hour question-and-answer session. No Big Ten teams making the College Football Playoff in 2017: "Without question it was disappointing that that did not happen. Every year's going to be different, so we'll see how the pendulum swings, but there are great teams in this conference, especially at the top of it. When you're playing competitive football games each and every week, when you have nine conference games instead of eight, it makes it a little more challenging. But I think any of our teams that represent the conference every year in the College Football Playoff has a chance to win it." If last season's seven wins set the bar too high for this season: "No I don't think so. I think for us, behind closed doors, we wanted to find a way to get to a bowl game and win it, and we did that. I think it was a success. Now this year in my opinion the schedule is more challenging. We have a lot of really tough football games at home that are going to be a challenge to win, but we gotta figure out a way to get that done. But for us to try to improve upon this past year, that will be a success, that's gonna be our goal. While we're always gonna set the bar high, we've got our hands full and we've got our work cut out for us." How to ensure there's no drop-off between Year 1 and Year 2 under a new coach: "The secret is just maintaining what you believe in and trying to compete on a daily basis and trying to go out there and get it done. I don't think you can think too much about what you did and you can't look too far down the road. I think our young men on our team have worked extremely hard, they give us great effort, they understand the importance of improving every day. We'll cut it loose. It's not going to be easy. If we win football games, it probably won't be by much, but we have to do all the small things that add up and give us a chance, and then roll with the punches from there." How he plans to use his true freshmen after the NCAA passed a new rule that allows players to play in up to four games and preserve their redshirt: "I think the new redshirt rule, everyone will have to adjust to. For us, I don't want to play a guy before he's ready. Sometimes that happens and it'll affect his confidence for the rest of the year. So I think we'll probably get guys prepared to play and if they're not quite ready then we'll hold them to midyear or after and see how it goes. If we're stuck using them early, that's fine, you can pull them out and save a few games for the end. There may be other teams that are farther along than us that will play them right away. We'll see how it goes. But for us, I would anticipate us getting guys ready, but not utilizing them and having them ready in the middle of the season and beyond." True freshman wide receiver Rondale Moore: "With Rondale, we're pushing the envelope. He's very talented, he's athletic, he's strong, he's ahead of the curve. He's got good football skills. We anticipate him playing and playing a lot. We don't want to give him too much, the playbook may be a little smaller for him to start off, but we want to throw a lot at him right now and then we'll figure out exactly what he knows and what he's good at and we'll narrow it down from that point. He's gotta be on the field for us, let him learn as he plays a little bit, let him make a few mistakes, because he'll have confidence. He'll be confident he can get it done. He's got some dynamic playmaking ability that we don't currently have. I think for a true freshman to come in where he's at, he is far along and that's good. He's played good football in high school, he's trained well, he loves the game to this point, and he's done everything we've asked, so I anticipate him having a very productive year." Junior linebacker Markus Bailey: "Markus Bailey is our best football player on the team. He will move to the inside this year so he can be in on more plays and get a chance to do what he does well. The linebacker position we're a little thin at, so we may have to move him around and continue to play on the outside some, especially in emergency situations, but he's a guy we want closer to the ball. He's very instinctive. He can make plays, he can avoid blocks, he can run around blocks, he can run through them. We've gotta have him where he can be around the ball."